Many of the docs linked form this one are out of date, but this is the best source of info on developer.apple.com. You can google around and find links to tutorials, however most of them are also way out of date and almost none of them bother to say what version of iOS and Xcode are being used. So for clarity I will say: I’m working with iOS 6.1 and Xcode 4.6. Less impt. – I’m running on OS-X 10.8.2 as well. I’ve got quite a bit of experience with this stuff from web programming. If you do not have a background in this area then the best place to start is the above linked library article. It provides a decent background on all of this. GNU GetText is another great place to look at for general information on i18n and l10n in software systems. As you read thru the Apple docs you’ll quickly see that they are written for Xcode 3.0 and all the menus are different now. I skimmed over all of this, but then I found it easier to “go to the source”. 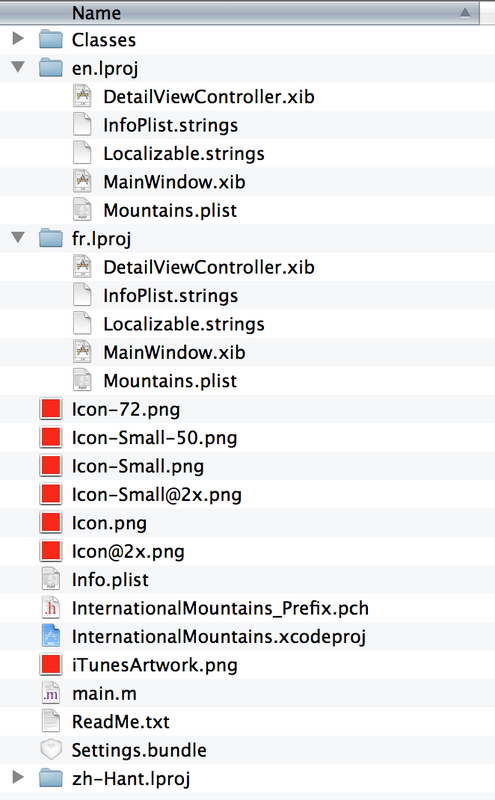 Grab the International Mountains sample app and open that up in Xcode. Check out the directory structure of the project. This app has been setup for Chinese, English, and French – you can see the separate directory structures (ending in .lproj) and their contents. Seems pretty obvious. 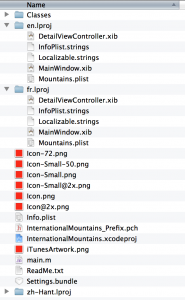 On a per language basis there are copies of XIB files, string files and then also plist files because there are strings used in things like the icon name for your app.Note that iOS apparently cannot deal with dialects of a language like French vs. Canadian French – OS-X can so I’m not sure what happens with that Chinese sample…maybe this has changed since the Apple docs were written. It is a bit concerning that the xib files themselves are placed in here. Any changes to the app’s screens will have to be replicated across all the files I suppose. We’ll address some of that later in the helpers and tools section of this post. Open up Xcode and take a look at this project. Open up the resources group and notice that things are nicely organized for you. At least that is good! Click on a xib to open it in the IB tool and then click on the Identity tab to see the configuration. Notice that this app was built back in the stone age for iOS3. I updated all of these to match my config and confirmed I can still run the app in my simulator. You have to change each one individually which is a pain. You should also update all the other spots in build settings likewise. So now that we have a model app, albeit a very ancient one, we can take a look at how to do this on one of my own projects. I have a project that uses both xib files and where I have hand coded a lot of modal screens and panels. I’ll need to use both IB and some command line tools to fully extract all my strings. Open up a xib file and click the identity tab in the assistant. About 2/3 down you’ll see a “localize” button. Use that and Xcode will do some “stuff”. If you look in the file system you’ll see that Xcode has moved the file to the en.lproj file and created a plist file. Unfortunately you have to manually keep your project tidy in Xcode itself. If you want to make another language it does not seem like there is a way to do this from IB. What I did was copy the en.lproj folder and then went back to my project, selected the xib file, and added the new xib file to the project. After doing that – Xode restructured the project view and IB location menu to indicate that there is now an english and french localization. I did the same thing with the InfoPlist.strings files. Not exactly intuitive…maybe there is a better way that I’m missing. Next you will need to create the Localizable.strings files and add them to your project. To add the first one, select your Resources group and then do a File -> New -> Resource ->Strings File. You should add this one to you en.lproj folder and make sure you name it Localizable.strings. To add the next one I had to do it manually because Xcode would crash. Go to finder and copy and paste the file you just created into the fr.lproj folder. Then add this to the Resource folder manually – voila. My project structure now looks like this. This is straight from the apple example. If you look in the RootViewController.m file you will see that they are in fact doing what I suggested – using the viewDidLoad() method to replace strings in the XIB file. Well that is a lot of work. I’m going to now actually do this in one of my projects and see how all this theory works out. I’ll post back an update here with my results and any changes in approaches that I come up with. Seems to work darn good! Will update with a screen shot.